It’s not just the Mirror online that seduces online readers with news that exists in headline form only. 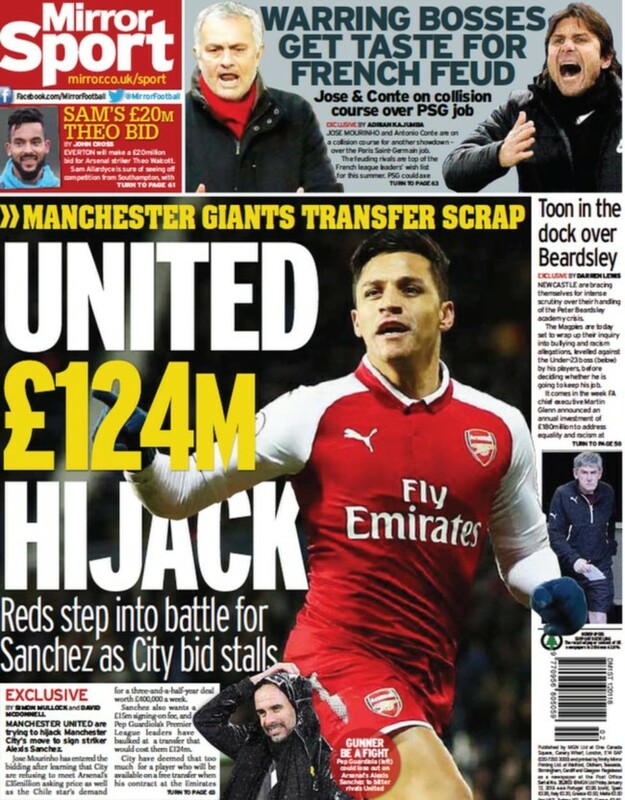 Today’s back page lead is that Manchester City are going to hijack Manchester City’s bid to recruit Arsenal’s Alexis Sanchez. And the fee? Well, it’s an eye-popping £124m! And after the headline the facts: Arsenal want £35m for their player. But before you can work it out how £35m becomes £124m, the Bleacher Report has echoed the Mirror’s “exclusive”. 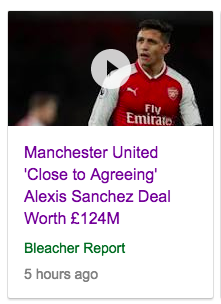 “Manchester United ‘Close to Agreeing’ Alexis Sanchez Deal Worth £124m,” yells the website. On what planet are Arsenal getting £124m for Sanchez? They’re not. The Mirror has added up the “striker’s demand for a three-and-a-half-year contract worth £400,000-a-week” and his “£15million signing-on fee”. Do all clubs pay the entire wage packet up front? The other part of the news is that Manchester City “believed a £20m fee and contract worth £300,000-a-week would be enough to land Pep Guardiola’s No 1 target”. And a bit of if. Arsenal have said they will only sell Sanchez if they have a replacement lined up, which is why they didn’t flog him to Man City in the summer.